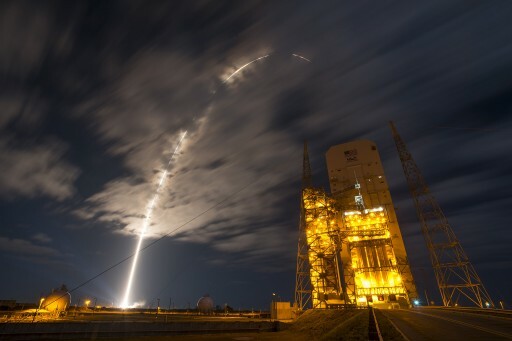 A United Launch Alliance Atlas V rocket lifted off under a full moon Tuesday night, rumbling into the dark skies over Florida’s Space Coast to carry the Cygnus OA-6 resupply craft into orbit for a cargo-delivery mission to the International Space Station. 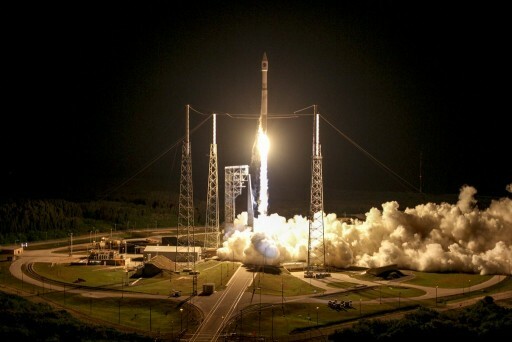 Atlas V blasted off from Space Launch Complex 41 at Cape Canaveral Air Force Station at 3:05 UTC on Wednesday, 11:05p.m. local time on Tuesday, providing a spectacular sight as it ascended along the U.S. East Coast. Atlas V fired its RD-180-powered Common Core Booster for four and a quarter minutes before handing off to the Centaur upper stage and its RL-10C engine that fired for a little over 14 and a half minutes to push the stack into an on-target orbit, 230 Kilometers in altitude. Riding the powerful Atlas V rocket on a fast trip across the Atlantic Ocean, Cygnus OA-6, named S.S. Rick Husband in honor of Space Shuttle Columbia’s last commander, separated from its booster 21 minutes after liftoff. 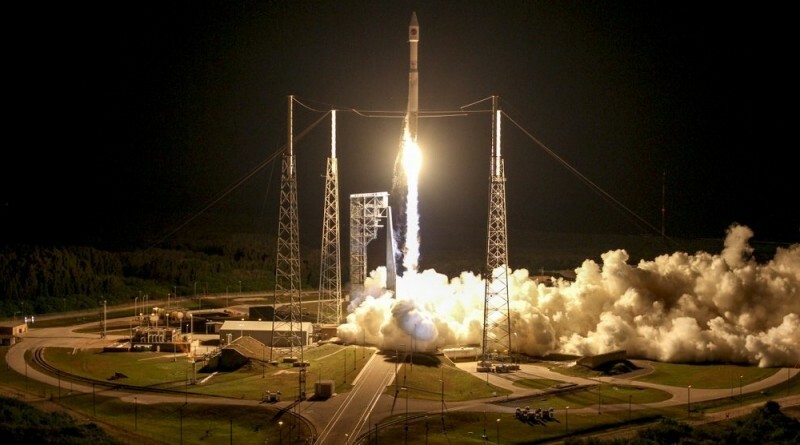 This marked the second successful Space Station launch carried out by Atlas V after last December’s Cygnus OA-4 mission, the first of two interim flights contracted to ULA after Orbital ATK decided to fit the Antares rocket with new engines as a consequence of the October 2014 launch failure. Embarking on a mission over two months in duration, the S.S. Rick Husband is set for a three-day journey to ISS filled with orbit-raising maneuvering to link up with the orbiting laboratory on Saturday to be captured by the Station’s robotic arm followed by berthing to the Unity module. Once open for business, Cygnus is booked for a stay of nearly two months, facilitating the delivery of 3,395 Kilograms of cargo to ISS. When cargo operations are complete and Cygnus departs ISS, the spacecraft is set for a free flight dedicated to the deployment of Cube Satellites and the first in a series of Spacecraft Fire Experiments. Aboard Cygnus is a wide variety of items needed aboard the Space Station ranging from food and supplies for the six crew members aboard ISS, over systems hardware and replacement components to keep the Station in ship shape, to science equipment supporting more than a dozen experiments currently active on ISS. 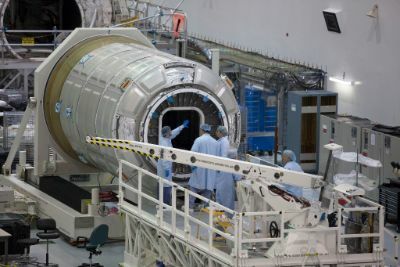 Cygnus OA-6 is the first of three missions carrying SAFFIRE Spacecraft Fire Experiment payloads, the first experiment to study large-scale fires to better understand flame growth dynamics and oxygen consumption in the microgravity environment. To date, only small scale combustion experiments were possible in space and spacecraft manufacturers have relied on models valid in gravity conditions when designing fire safety systems for use in space. SAFFIRE will light a large piece of fabric on fire in an experiment enclosure after Cygnus has left ISS and document the burning process with cameras and other sensors. Science equipment to be delivered to ISS includes an experiment looking at how asteroid and comet surface material behaves in microgravity to better understand possible problems when attempting to anchor a spacecraft on such a regolith surface. 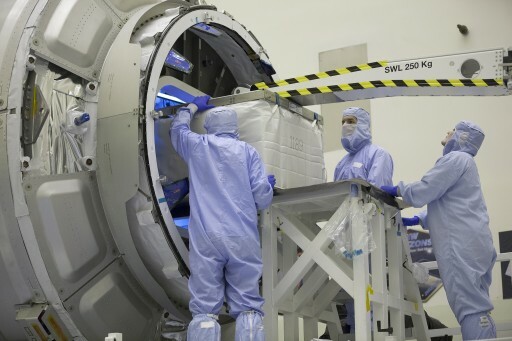 Another payload flying on Cygnus is Meteor, a camera system designed to capture the spectral signatures of meteors burning up in Earth’s atmosphere to reveal the composition of their parent bodies formed billions of years ago, thus peering deep into the past of the universe. This is the third attempt to fly Meteor to ISS after units were lost in the 2014 Antares launch failure and 2015 Falcon 9 mishap. Cygnus is also delivering a new 3D printer to ISS so that tools and components can be manufactured right there aboard ISS, further testing the ‘machine shop in space’ that is the ultimate goal to achieve when launching on a deep space mission to be able to manufacture tools and systems parts as needed. Other technical demonstrations flying on Cygnus include a gripping device using gecko technology, a new type of heat pipe for future use in spacecraft, and a miniature exercise device to be tested on ISS for future application in spacecraft where space is limited. 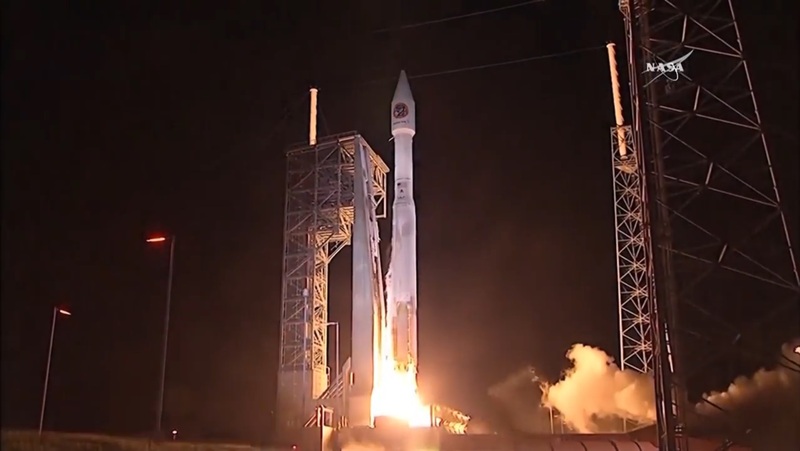 Tuesday night’s Cygnus launch was the second of two missions using the Atlas V launch vehicle contracted to United Launch Alliance by Orbital ATK as interim flights to bridge a gap in Antares missions due to the need for repairs at the Wallops Flight Facility after the 2014 failure and time needed to re-fit the Antares rocket with new engines for its return to flight mission. Antares, now flying in its 200 series with RD-181 engines instead of the NK-33-based AJ26 powerplants, is currently aiming for a hot fire test in late April and liftoff No Earlier Than June, depending on how the ISS cargo flight schedule shapes up. 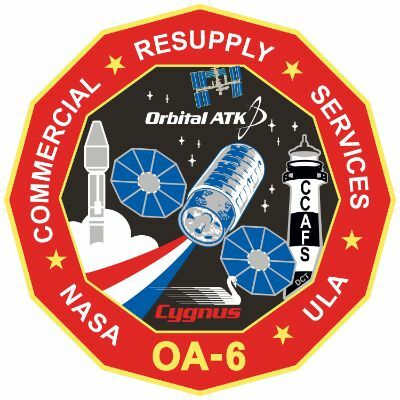 The OA-6 mission is also the second flight of the Enhanced Cygnus Spacecraft that debuted in December, featuring a stretched cargo module to hold a greater cargo volume, new circular Ultra Flex solar arrays and improved Service Module Systems as part of weight reduction. 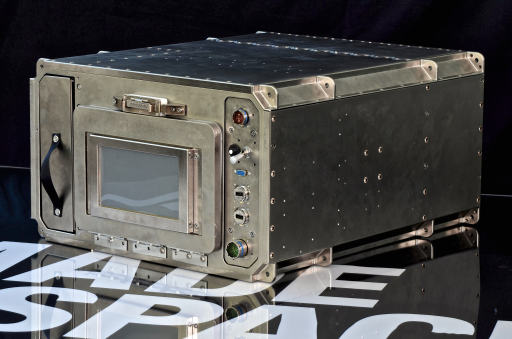 Newly introduced by OA-6 is the capability of deploying CubeSats during the free flight of the Cygnus spacecraft, employing a NanoRacks deployment system installed on the spacecraft’s Service Module. 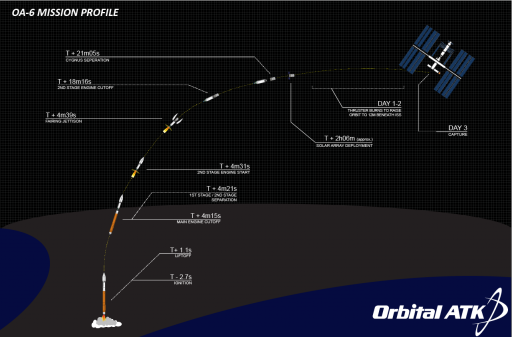 Using the powerful Atlas V rocket allowed Cygnus to be loaded to capacity and provided the unique advantage of a long launch window of 27 minutes with five discrete launch opportunities, each with its own trajectory computation – owed to excess performance available to complete cross-track maneuvering during flight and steer Atlas V back into the orbital plane of ISS if launching early or late in the window. Atlas V and its launch team at the Atlas Spaceflight Operations Center entered countdown operations seven hours and 20 minutes ahead of the opening of the night’s launch window. 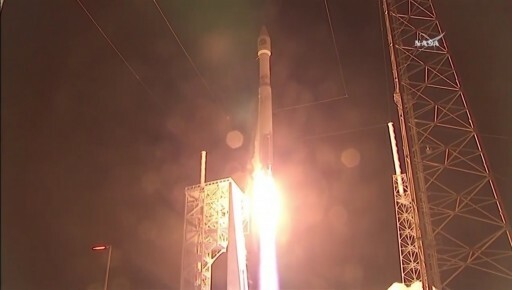 The first order of business was the activation of the Atlas V rocket and a series of avionics, Flight Termination System, guidance, communications and propulsion system testing operations to ensure the vehicle was ready for flight. At the launch pad, engineers finished close outs of the Atlas V rocket and the various launch pad facilities, also buttoning up the Vehicle Integration Facility from where Atlas V was rolled to the launch pad on Monday. At the Morrell Operations Center, Eastern Range Controllers set up range instrumentation and began monitoring the clearance of the blast danger area and downrange corridor as tanking approached. 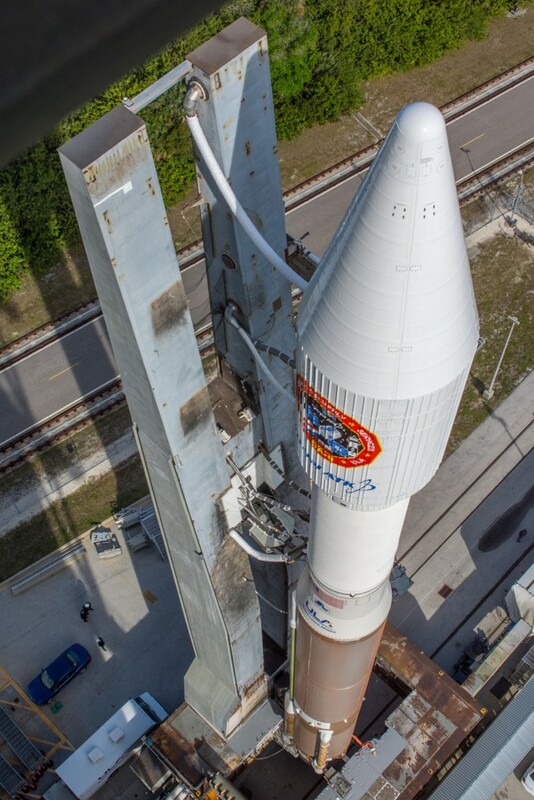 The countdown stopped at T-2 hours for a 30-minute built-in hold to allow the Launch Team to finish the setup for propellant loading and complete the necessary polls to attest Atlas V a clean bill of health ahead of tanking. 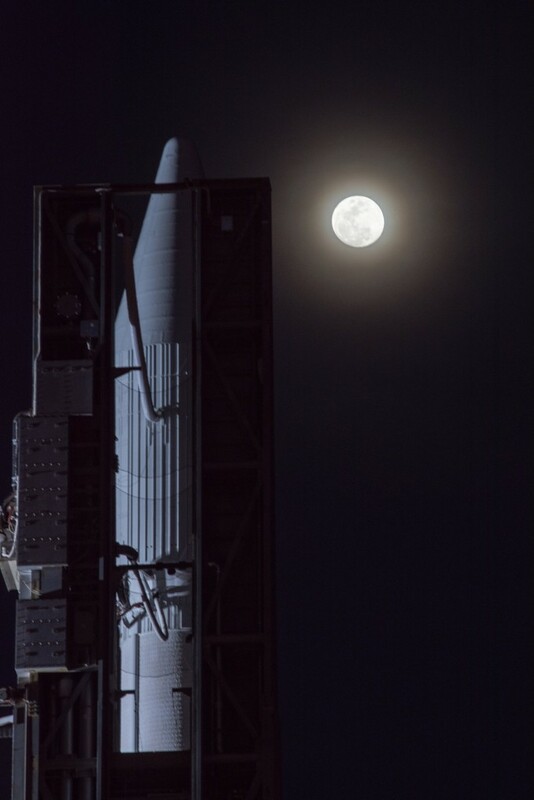 As soon as clocks started ticking, Atlas V began a 90-minute tanking operation, starting with the chilldown of ground systems and tanks before -183°C Liquid Oxygen oxidizer first began flowing into the upper stage followed a short time later by the Common Core Booster. The first stage received 185,500 liters of the supercold LOX while Centaur was loaded with 15,700 liters of oxidizer and 48,100 liters of -253°C Liquid Hydrogen, with fuel loading picking up one and a half hours ahead of liftoff. The first stage had already received its fuel load of 94,600 liters of Kerosene after Monday’s rollout. 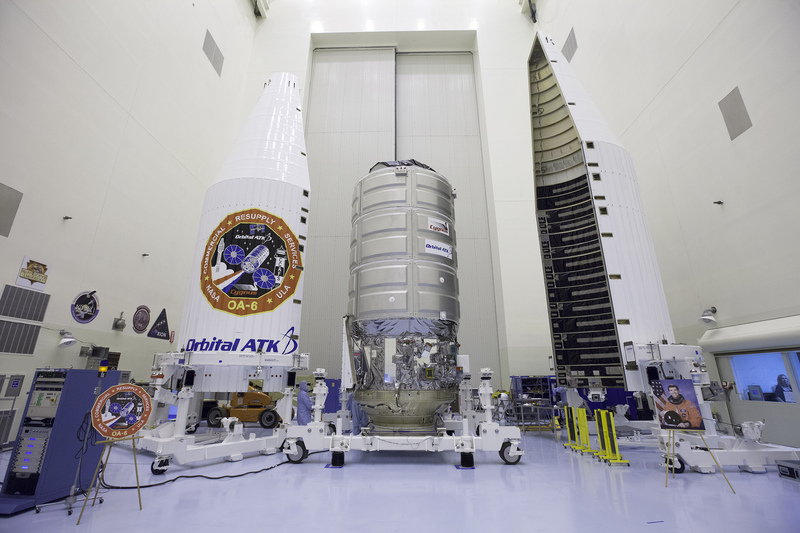 To lift the 7,500-Kilogram Cygnus into orbit, Atlas V only required its most basic configuration comprised of a two-stage stack with the Common Core Booster as first stage and the trusted Centaur Upper Stage sitting atop. The rocket stood 58 meters tall and 3.81 meters in diameter with a total launch mass of 334,500 Kilograms when fueling had finished around half an hour prior to liftoff. 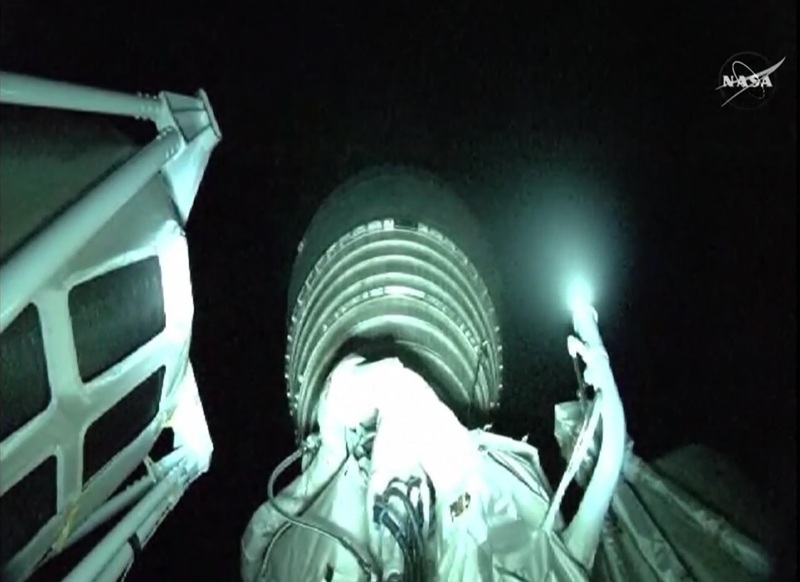 Heading into the final hour of the count, Atlas V repeated the most critical checks, tested the engine gimbaling system and received its flight profile based on the latest measurements of upper level winds. Clocks stopped again at T-4 minutes to give all teams a chance to catch up with any open work and finish the transition of the Cygnus spacecraft to battery power ahead of the final poll of the entire Launch Team. 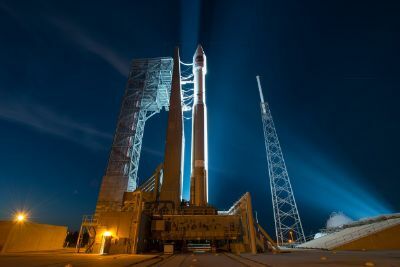 All was in readiness for the 62nd Atlas V launch, the second to the International Space Station, and Atlas V headed into the busy end of the long countdown, going through a carefully designed sequence to transition to its autonomous launch configuration. The two-stage rocket pressurized its propellant tanks, switched both stages to internal power, transferred to onboard control and armed its Flight Termination System – all under the watchful eyes of the Launch Team and supervised by computers. The two-chamber RD-180 engine came to life three seconds prior to liftoff, throttling to a launch thrust of 390 metric-ton-force. 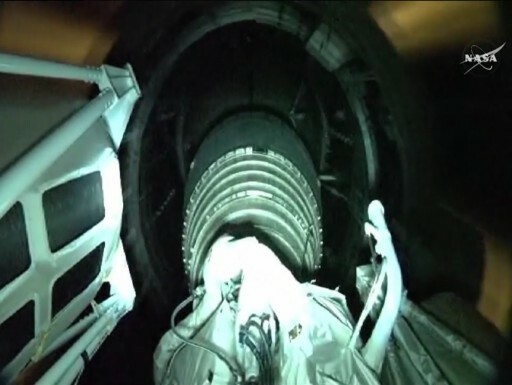 Engine ignition was monitored by computers to ensure the Russian-built powerplant reached operational conditions before releasing the hold-down system of the Atlas V launcher – marking the point of no return. 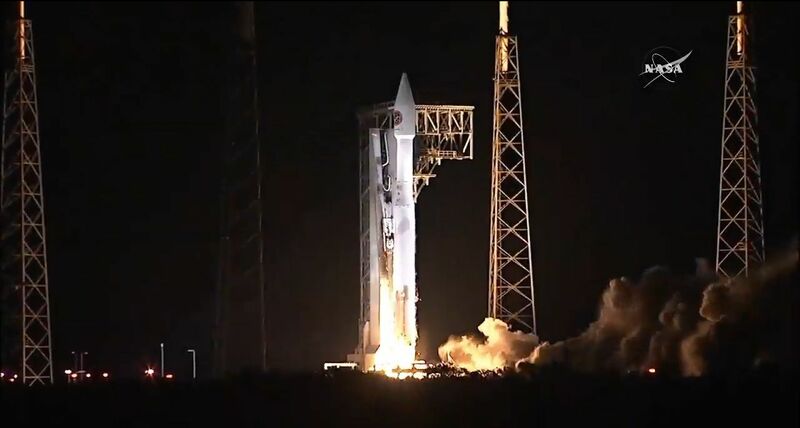 Atlas V left the ground at 03:05:52.227 UTC, making a gentle liftoff to begin its 21-minute climb to orbit featuring a relatively simple flight profile compared to what Atlas V is capable of and has flown in the past. Lighting up the night skies over the Space Coast, Atlas V ascended vertically for 18 seconds, using the two gimbaled nozzles of the RD-180 engine to balance in an upright posture before initiating the pitch and roll maneuver to enter its precisely calculated launch trajectory taking it along a 44.4-degreee launch azimuth. The mission was set up to fly a coast-hugging trajectory, heading north-east along the U.S. East Coast before flying over the Atlantic and passing over Central Europe after engine shutdown. Observers in the U.S. and in Europe had a chance to see the launch – the propulsive flight phase including stage separation visible from the East Coast while Central and Eastern Europe was treated to a visible pass of the Cygnus spacecraft and the Centaur upper stage immediately after separation, provided observers had a lucky gap in a dense cloud cover over the majority of Central Europe. Half a minute after lifting off, Atlas V enabled its Propellant Utilization system to ensure an optimized consumption of propellants by adjusting the mixture ratio of LOX and Kerosene supplied to the engine. 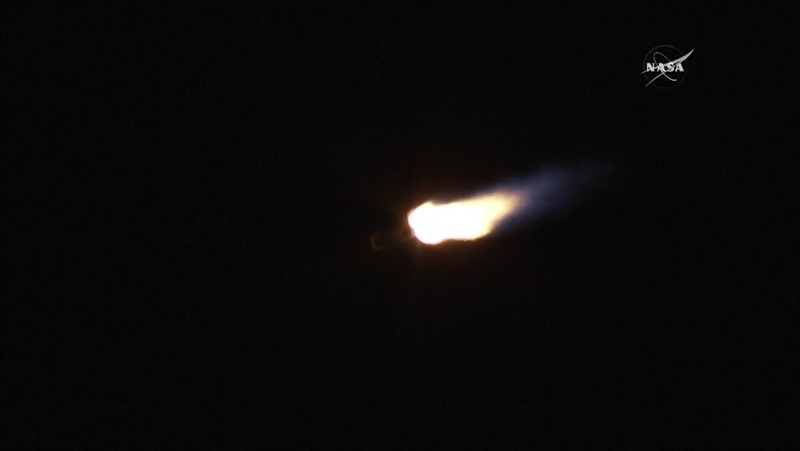 With RD-180 burning through 1,150 Kilograms of propellants, Atlas V concluded its pitch program and headed into the Zero-Angle of Attack guidance mode, flying a pre-programmed attitude profile to navigate through winds in the upper atmosphere. Atlas V passed the speed of sound 78 seconds into the flight with Maximum Dynamic Pressure 12 seconds later, requiring RD-180 to throttle back for a brief moment while the ascending rocket encountered MaxQ. Closed Loop Guidance on the first stage was enabled when the launcher had reached a pre-defined altitude and speed to allow Atlas V to adjust its flight profile based on navigation data in order to hit the precise first stage cutoff target. 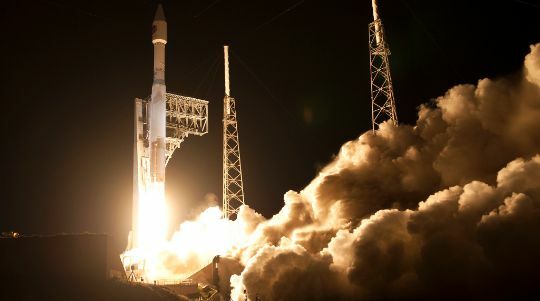 Flying through the rarefied layers of the upper atmosphere, Atlas V’s thrust increased to 422 metric ton-force until, approaching the end of the first stage burn, RD-180 began throttling back in order to limit accelerations to 5Gs as the vehicle only weighed of what it did at liftoff. Late in the burn of the first stage, Centaur prepared to assume control of the flight – firing a pyro valve to initiate the pressurization of the upper stage’s attitude control system and completing a short in-flight chilldown of the RL-10C engine to set up for its ignition. RD-180 shut down four minutes and 15 seconds after liftoff, having burned 284 metric tons of propellants to send the vehicle on its way. Six seconds after Booster Engine Cutoff, pyrotechnics were fired to severe the connection between the Common Core Booster and Centaur. Eight retrorockets then fired to pull the spent first stage away from Centaur, clearing the engine nozzle of the RL-10C engine. Upon staging, Centaur purged its reaction control system with nitrogen and RL-10C pre-started on fuel and oxidizer ahead of ignition ten seconds after stage separation. RL-10C reached its full thrust of 11,200 Kilogram-force, tasked with a burn of 13 minutes and 45 seconds to finish lifting the Cygnus spacecraft into orbit. Eight seconds into the burn of the upper stage, the protective payload fairing was separated as the vehicle had reached sufficient altitude where aerodynamic forces could no longer harm the Cygnus spacecraft or its Common Berthing Mechanism that faced the direction of travel while the vehicle was riding atop the Atlas V.
After fairing jettison, Centaur enabled Thrust Vector Control and corrected body rates that had built-up during staging and fairing separation for which engine gimbaling was suppressed to avoid inadvertent contact with the separating structures. Because the mission lifted off at the start of the window, Centaur had to make a dogleg to complete a cross-track maneuver and steer into the orbital plane of the Space Station. Centaur’s burn appeared to run longer than published in the mission timeline with shutdown coming at around T+19 minutes and 18 seconds, running approximately 62 seconds longer than specified in the timeline given by ULA and calls made during the launch broadcast. Separation of Cygnus was also late when using the official timeline as a reference, though the achieved orbit was on-target – shown as 229.9 by 230.2 Kilometers by Centaur’s navigation data and 232 by 237 Kilometers, 51.65° in the first set of tracking data. 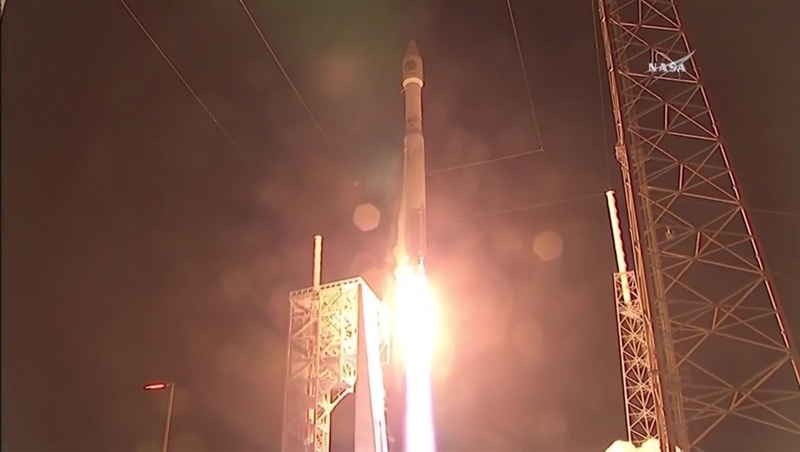 The target was a circular orbit at 230 Kilometers, confirming that Atlas V achieved its primary goal of lifting Cygnus to its planned orbit. 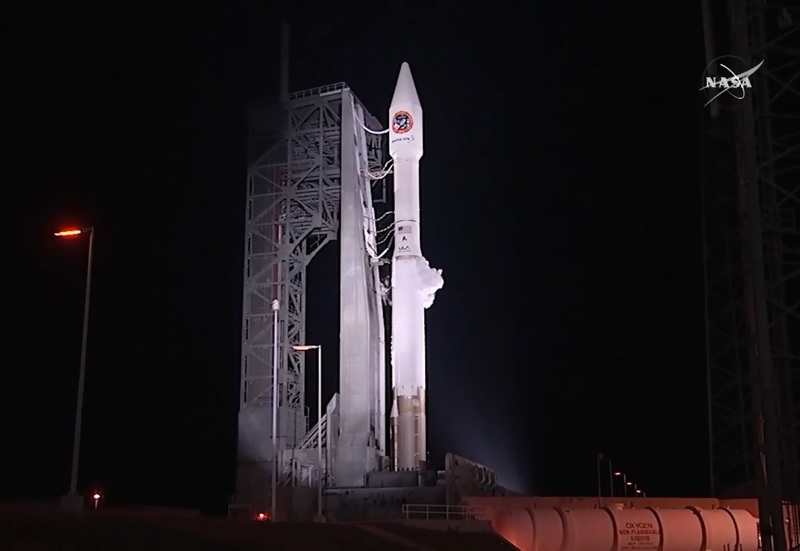 Cygnus was sent on its way 22 minutes into the flight after Centaur completed a re-orientation. 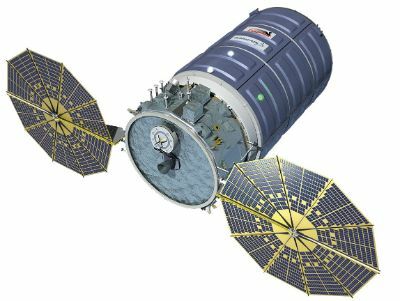 Separating from the upper stage, Cygnus was to complete and initial sequence of establishing a stable three-axis orientation and sending telemetry to the Orbital ATK Mission Control Center in Dulles through the Tracking and Data Relay Satellite System. The last critical step in the vehicle’s launch sequence was the deployment of the two UltraFlex solar arrays at T+1 hour and 36 minutes, a 20-minute process after which teams were able confirm the spacecraft was power-positive and healthy in orbit. 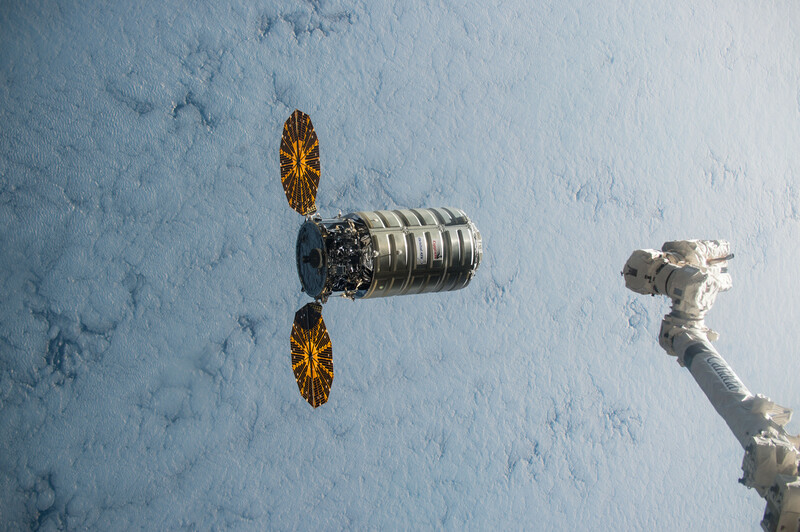 Parting ways with Cygnus, the Centaur upper stage completed a Collision Avoidance Maneuver. 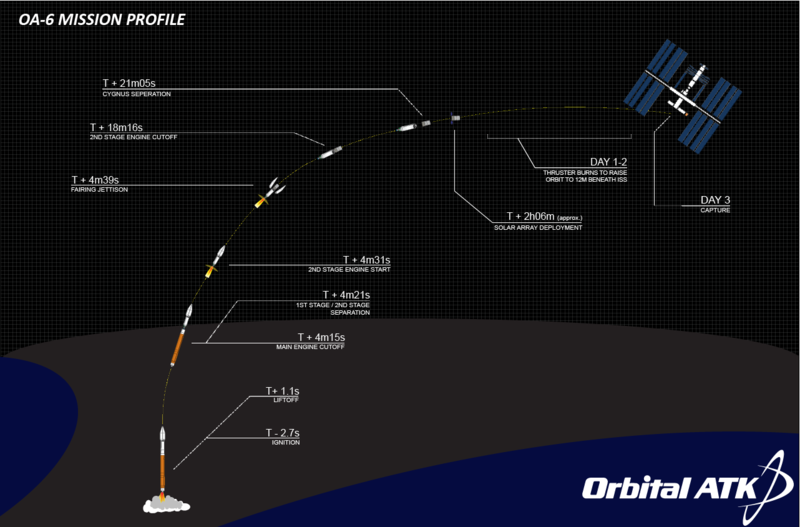 48 minutes after launch, Centaur is expected to make a targeted deorbit burn of just 11 seconds to set up for a destructive re-entry over the Indian Ocean, south of Australia – away from any populated areas. For Cygnus, the climb up from its low insertion orbit towards the 400-Kilometer orbit of ISS begins later on Wednesday with a large Delta-V maneuver over ten minutes in duration to raise the vehicle’s orbit and begin closing in on ISS. Another large DV maneuver is completed later on followed by a plane adjustment burn and a pair of optional orbital corrections for fine-tuning. Another DV burn pair is expected to be conducted later in the week to set the spacecraft on its approach course towards ISS, closing in from behind and below before initiating the rendezvous sequence in the early hours on Saturday (UTC). 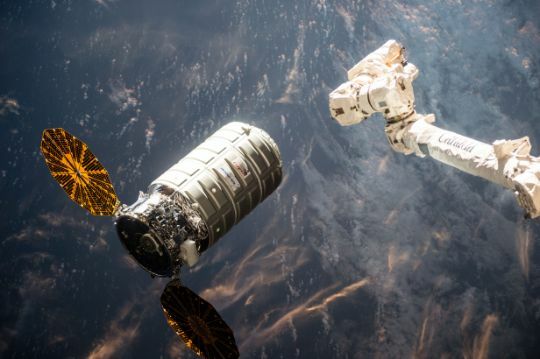 The rendezvous includes a series of propulsive maneuvers to put Cygnus on a path to reach a position directly below ISS from where it will ascend vertically to come to a halt at its capture point. Controlling the Station’s robotic arm, NASA Astronaut Tim Kopra will be ready for the robotic capture of the spacecraft expected at 10:40 UTC on Saturday to mark the beginning of a stay of over one month to facilitate the transfer of 3,400kg of cargo from Cygnus to ISS and about 1,500kg of disposal items in the reverse direction. Cygnus is booked for a stay of nearly two months, remaining attached to the Unity module of ISS through mid-May. If everything goes according to plan, ISS will see its first period of dual-docked operations involving two commercial cargo craft on the U.S. Segment when the Dragon SpX-8 spacecraft arrives after its planned April 8 launch on a Falcon 9 to take up its spot at the Harmony berthing port.